Flying into and out of Vancouver British Columbia is a pleasure because the Vancouver International Airport (YVR) is such a great airport. It has been named the best medium sized airport in North America, the second best airport on the continent, and the tenth best in the world. Business travelers have rated it #3 in the world. Vancouver’s International airport also has perhaps the most convenient hotel location in the world. 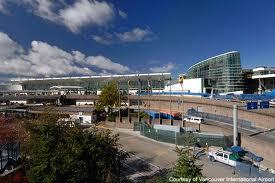 The Fairmont Vancouver Airport Hotel is located in the Departures Terminal of the airport. This is a four-diamond luxury hotel with soundproof rooms, free internet access, day use rooms, conference facilities, and a full sized health club including a pool. The hotel’s main entrance is located at International Departures, so you can go from your room to your flight. The Canada Line train system offers the fastest and most economical transportation from Vancouver Airport to downtown Vancouver. Trains depart every 7 minutes from early morning until late at night and the fare is about $8.75 depending on the time of day you’re traveling. The trip between the airport and the terminus at Waterfront Station takes just 26 minutes. If you depart from the train station at the Main Street Station, you have to transfer at Waterfront Station, and the duration of the trip is 45 minutes. The Canada Line station is located across the street from Vancouver International Arrivals and just a down from Domestic Arrivals. For those who prefer private transportation, taxis and limousines are also available just outside the terminal doors. To arrange private transportation in advance with meet and greet convenience, contact us at 1-800-913-9207 or 1-604-990-9299 and we can arrange transportation by SUV, town car, limousine, Sprinter Van, luxury bus, mini bus or full sized bus. We monitor your flight and arrive, even if you’re flight is delayed, at the right time. We also also provide transportation from Vancouver Airport to the Tsawwassen Ferry Terminal for ferry service to Victoria. 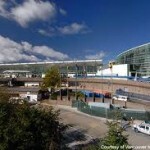 Most major, many regional and some minor airlines fly into Vancouver International Airport. You can make arrangements by phone as well to fly from the airport to downtown Victoria once you get off your flight in Vancouver. Call to book your Airport to Victoria or Nanaimo flights: 1-800-913-9207 or 1-604-990-9299.